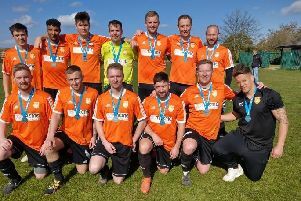 Peterborough Northern Star reached the semi-finals of the Northants County Cup yesterday (January 8) but not before being given a scare by lower level Netherton United. East Midlands League Premier Division title-chasers Star found themselves trailing 2-0 to the Cambs League Premiership side with almost an hour gone at Chestnut Avenue but eventually triumphed 5-2 to earn a semi-final clash with Corby Town away on February 19. Netherton opened the scoring on 39 minutes with a goal by Sian Gamble and went 2-0 up through Megan Strickland on 51 minutes. Cassie Steward started the Star fightback with a goal four minutes later and then levelled matters when latching on to a lovely through-ball by Donna Nicholls. Steward then turned provider to set up Sophie Patterson as Star took the lead for the first time and then with 10 minutes left she completed her hat-trick to make it 4-2. Chanade Henderson added Star’s fifth goal with two minutes remaining.